The Memorial to those Officers and Soldiers of the 22nd Bn. The London Regiment (Queen’s) who died in The Great War of 1914-1918 stands in Old Jamaica Road, Bermondsey in South East London. It was erected about 1921 adjacent to the old Drill Hall yard and there are over eight hundred names inscribed on the Memorial. After the Second World War a plaque was added to the Memorial to commemorate those of the 6th (Bermondsey) Bn. The Queen’s Royal Regiment who had died in the 1939-1945 conflict. Their names are inscribed in a Book of Remembrance which is displayed in the Bermondsey Parish Church of St Mary Magdelene, next to the Colours of the 22nd Bn. The London Regiment (Queen’s). 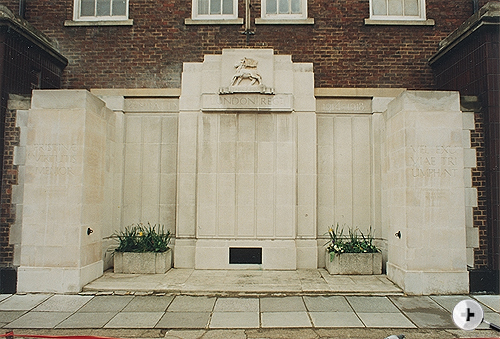 In 1953, when the Drill Hall was extended, the Memorial was incorporated into the exterior wall of the new building. 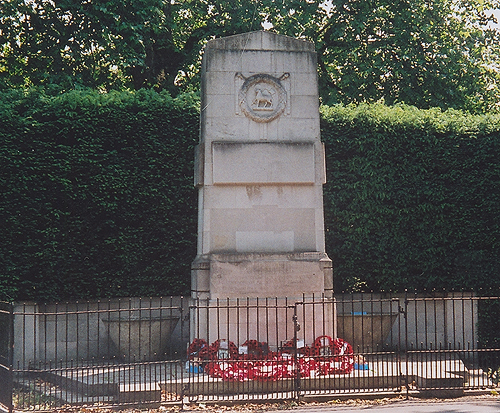 In 1994, a certain amount of restoration work was carried out when the Portland stone of the Memorial was showing distinct signs of wear, caused by the weather and the South East London environment. Standing in front of the Memorial are two stone flower boxes, on which are displayed Memorial Plaques to two of the Regiments distinguished Officers, Colonel J G Bevington, TD and Colonel C H Nice, TD, DL. Old Jamaica Road, Bermondsey, London. In West Street, Bermondsey adjacent to the Bermondsey Borough War Memorial, stands a Memorial Stone to whose of the Borough, who gave their lives in the South African Wars of 1899 to 1902. Inscribed on the stone, together with the names of other Regiments are those of the 3rd Volunteer Bn. The Queen’s (Royal West Surrey Regiment). It is believed that this Memorial Stone was originally erected in the vestibule of the Bermondsey Town Hall in 1903 and was unveiled by General Sir Redvers Buller. The report of the occasion mentions that Lord Roberts was unable to accept an invitation to attend. The 1/24th and 2/24th Bn The London Regiment (The Queen's) Memorial. dedicated to the 1/7th and 2/7th Battalions, The Queen's Royal Regiment. Kennington Park, London.